that the empire has opened. Barefoot and penitent, Honorius set out for St. John Lateran, the clergy and people following him, with no less signs of penance. There he prayed a long while. He returned to his palace and wrote a circular to all the bishops, ordering that all those in their dioceses who had taken up the cross be urged to be ready to leave quickly for the Holy Land. When the crusaders gathered in Tolemaida, he laid out the plan for the campaign. Rather than a forced entry into Palestine, he felt the system devised by Innocent III, with notable political foresight, more suitable: invade Egypt, close off and take Damietta. On the shores of the Nile at that time, encamped in tents nailed into the sticky mud, were the king of Jerusalem, the indomitable John of Brienne, assisted by the patriarch, a great many bishops, the duke of Austria, the Knights Templar and the Knights of St. John, and veteran German and Frisian regiments. At the beginning of the undertaking, as often happens, there was a great deal of union, harmony and enthusiasm. Later, with delays in the long and difficult siege, temperaments cooled and the old peace and harmony turned into rancor and enmities in the Christian camp. The troops ridiculed the workers and vice versa. Sword fights broke out among people from different countries for the slightest reason. The disorder reached its peak when Cardinal Pelagius, the papal legate, tried to arrogate to himself the supreme command, which belonged to John of Brienne. Entangled and distracted by internal discord, the crusaders neglected the essential, not closing in on Damietta as they could have, if they had taken advantage of the critical situation of the Mussulmans and the death of Malek-Adel, and thus, in the Latin army, military orders were adopted with neither wisdom, prudence nor sense. It happened on one occasion when the forces of John of Brienne were poorly disposed and even more poorly situated, the mutineers compelled him to enter into battle. On the eve of the day of combat, when the soldiers were polishing their weapons and the whole army preparing for combat, two very tired and miserable penitents arrived at the camp. One of them, having asked to see the leaders of the crusade, begged them in the name of God to desist from entering into action and, if they did not, they could expect a disastrous defeat. The captains laughed at the omen for, at that time, visionaries, seers and prophets swarmed around the camps and their prophecies were not given much credit. But, within a few hours, the omen of the penitent was fulfilled, the hot soil of Egypt drinking in streams of Christian blood. Six thousand fighters perished in that lamentable expedition and the heads of fifty crusader chiefs were carried in baskets to the sultan. Francis was the penitent who, for the third time, went in search of his longed-for martyrdom. To more easily attain the object of his longings, at the end of the Chapter of the Mats, he assigned the government of the order to Elias, provincial minister of Florence, reserving to himself the mission of Levant. He took with him twelve companions and set off for Ancona to embark. During the days he was detained in the port awaiting a ship, many neophytes joined him, insisting on following him to Syria. Then Francis called a young child who happened to be passing by, getting him to indicate, by pointing his finger, those he should take in his company, and the child pointed to the twelve already selected by Francis. Among these were Peter Catani, Barbarus, Sabbatino, Illuminatus and Leonard of Assisi. They set sail for Cyprus, from whence they passed to Tolemaida. There Francis broke up his group and divided the diverse provinces among them, with the assignment to go forth preaching the faith. He remained there with no one but Friar Illuminatus and, continuing their journey, they arrived within view of Damietta, where the crusaders’ army had their quarters. Malek wavered. To be converted was to give up the national flag. It was to make a carpet of it where the spurs of crusaders would claw it. The conqueror and the monarch in him were awakened and he shook his head, no. The sultan decided not to consent to the experiment, fearing some miracle that might sow panic in his victorious ranks, but he demonstrated to Francis the best he knew and could of his love and respect. He heaped him with gifts that were not accepted. He gave him complete freedom to travel through his dominions, and, on leaving him, he was noticeably grieved. Malek provided Francis with a safe conduct with which he could penetrate the interior, preaching the faith of Christ, that is, if the pilgrim added the command not to curse Mohammed. Francis and Illuminatus continued their journey, but their mission yielded little fruit. The hatred for the name Christian was old and deep after so many and such fierce combats and the words of Francis that in the west, according to St. Bonaventure, ignited souls like a burning torch, in the east did not get past their ears. During the course of so sterile a journey, a lovely and lascivious young Egyptian girl sought illicit romance in Francis, and on seeing her in front of him, dressed and adorned to incite, with an alluring and tender smile on her lips, and in her eyes the fire of the eastern sun, her voice disturbing and uttering tender endearments with siren stains, Francis seized a handful of blazing kindling from the fire and, scattering it over the ground and tearing off his habit, threw himself down over the red-hot wood, inviting the young girl to make of that bed of fire the site of the proposed nuptials, and the historians add that the impudent woman, crying and ashamed, seeing the innocent flesh of the saint subjected to such torture, was converted and had herself catechized and baptized. From the camp, Francis continued on to Palestine, visiting the Holy Sepulcher, and, in the harsh solitude near Antioch, he came upon an ancient monastery of Benedictines who, en masse, exchanged their black cowls for the Franciscan sackcloth. What Francis could not achieve in his person, he achieved in that of his brothers. On claiming for himself the regions of the east, he had chosen and destined for those of the western Saracens six missionaries: Berardo, Peter, Adjuto, Accursorio, Otto and Vitale, who led them. Following the example of Joshua, Francis sought men strong and sober, disposed to every conflict and hardship, for the most dangerous undertaking. On bidding them farewell, understanding that they were going to imminent danger, with great tenderness and crying, he gave them the kiss of peace and his blessing. This, the breviary, and the rule were all the provisions they carried. They entered Spain, passed Aragon, where the superior, Br. Vitale, mortally ill, saw he could go no further and, yielding his authority to Berardo, ordered his companions to continue on their way. Urraca sent the brothers, well recommended, to the princess Sancha who lived in Alenquer and there they were lodged in a monastery, a foundation of St. Francis and a donation of this blessed7 princess who provided the missionaries with secular garb so they might continue their journey without obstacles. Thanks to the disguise they penetrated the Mauritanian territory and entered the populous and magnificent Seville, boastful of its six-league aqueduct, its famed tower, its stately astronomical observatory8 and its incomparable mosque where so soon the Franciscan tertiary, St. Ferdinand, would plant the cross. The friars placed themselves in front of one of its filigreed doors and, not without having dressed in their habits again, Berardo, who knew the Arabic language, preached. It was a festival day. The crowd was immense. It was moved to shouting and outrage and they were thrown out with scorn as fools and madmen. They went to another mosque and continued their talk, with the same result. Undaunted, they entered the palace of the emir and he, more in disgust than in anger, put them in the Tower of Gold as prisoners. From the high windows they exhorted the passers-by. Then they were taken to a dungeon, without being fed, and shackled in irons until, not knowing what could be done with them and not wishing them to be offered as a bloody spectacle in cultured Seville, they were put on shipboard for the place they most longed to go: Morocco. The favorite of the miramamolin and general organizer of his armies was there at the time, a Portuguese prince, Don Pedro, whose discords and disgust with his brother Alphonse led to the ignominious extreme of his offering his sword and his intelligence to the enemies of his God. The missionaries stated to Don Pedro how they came to preach the faith and the prince, appalled, tried to dissuade them from their intention. The Moroccans tacitly tolerated Christians. Without mistrust they saw a Catholic commander at the head of Saracen troops. Commerce increased and prospered between southern Spain and El Maghreb, and behold, now they were going to lose so much because of the determination of five men intent on seeking martyrdom, but the friars were not pleased with the prince’s reasons and, climbing up on a cart, they exhorted the multitudes. Imprisoned in the desert by order of the miramamolin, they returned to the city as soon as they found themselves free and were incarcerated again with the intention of letting them die of hunger. The prince, Don Pedro, afflicted by grief and terror, piously recovered the cut-up relics that, after having served for the mockery of the people, had been left as foods for beasts and birds of prey. The Moors discovered it and attacked the palace of the prince to take from him the holy spoils and, in the fray that broke out, Martin Alonso Tello, a Portuguese nobleman, and Fernando de Castro were killed defending them. Finally, the Saracens carried the relics away and threw them in a fire that did not light or destroy a single hair of the heads separated from the bodies. By the power of gold the prince was again able to rescue them. He found three innocent young boys to wash, anoint, embalm and wrap the pure bodies in clean lace-trimmed crepe and placed them in heavy silver urns. At that time he received, jubilantly, a secret message from his brother, King Alphonse, offering him peace and calling him to his side. He arranged his flight in great caution and, after a dangerous and dramatic journey through the Atlas mountains, his only guide being the instinct of the mule on whose back the precious relics traveled, he was able to embark for his country, just in time, for the miramamolin, his suspicions heightened by the incident of the protection of the martyrs, was preparing a noose for his neck. Surely Morocco, like Palestine, was a difficult and refractory land, when neither the blood of martyrs in the one nor the presence of St. Francis of Assisi in the other succeeded in affecting them, but perhaps the Moslems, a people formed by the scimitar, to receive the gospel, needed another conqueror to undo the work of Mohammed and plow with the sword the sterile ground before scattering in it the seed. For a fatalistic and sensual race that put God on the side of those who triumphed, there is no missionary more persuasive than a conqueror, nor eloquence like that of razed cities and defeated kings. In Europe, Christian for so many centuries, the voice of poor Francis preaching evangelical rigor had to do no more than prick consciences to awaken ideas absorbed with mothers’ milk, dissolved in the spirit of the people, debilitated, perhaps, but never dead. The descendants of Agar, given to dreams of a paradise of material goods whose entry was purchased at the price of the heads of enemies, delighted by poetry, color, and light, by the sensual and tangible, could not be moved by the spiritual beauty of poverty, of penance, of the folly of the cross. Thus in Morocco they did not even honor the missionaries with the suspicions that novelties arouse. They simply took them for madmen and maniacs, inoffensive at first, nuisances later, and finally intolerable. Let us return to Francis, who was traveling in Italy driven by the desire to defend his lady, the virgin poverty. For, while the five red Franciscan flowers perfumed the ancient garden of the fabulous Hesperides16 and the order won its first laurels in Mauritania, in Italy it encountered its first setback and the first discordant note resounded in the celestial symphony of Assisi. Already in the Chapter of Mats, John of Eustaquia and Elias of Cortona had tried to insinuate to Francis, by means of the cardinal protector, Ugolino, the suitability of mitigating the rigor of the rule with regard to poverty – and we know Francis’ reply. Now, around that same Elias, named general of the order, there began to gather those who wished to exalt the order according to the flesh and not according to the spirit. News came to Francis’ ears of the building of large and sumptuous monasteries, of habits of fine wool, of comfortable and pleasant cells, as well as of grave novelties in the interior regimen. 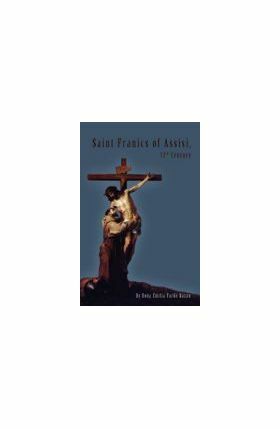 His friars, taught to eat indifferently what charity provided them in the manner of the poor and mendicant, as Christ taught his apostles when they traveled through the world and to live the same on succulent dishes as on coarse cornbread, were now subjected to a fixed rule of abstinence from meat – an apparent austerity that in reality clashed with the spirit of the rule. To Francis the return trip to Europe was very long. From Venice Francis went to Padua, to Bergamo, to Cremona where he again met Dominic de Guzmán who, in response to Francis’ pleas, blessed the unhealthy waters of a cistern, purifying them. From Cremona he continued on to Mantua, entering at last in the learned Bologna. An immense crowd came out to greet him at the gates of the city. The time when professors and legislators scoffed at the poor men of Assisi was past. The fame of Francis filled Christendom and people trampled on each other to contemplate the extraordinary man at close range and to touch the hem of his well-worn tunic. I, Thomas, citizen of Spalatro and archdeacon of the cathedral church of the same city, being a student in Bologna in the year 1220, have seen on the day of the Assumption of the Mother of God, St. Francis preaching in the public square in front of the palace, with all the city gathered there. He divided his sermon in this manner: angels, men and devils; and on these creatures, all of them intelligent, he lectured so well and with such precision that many men of letters who heard him marveled that such a simple man should so speak. He did not follow the usual style of preachers, but as a popular preacher he spoke solely of the suppression of enmities and of the need to arrive at peace and harmony. His habit was torn and dirty, his frame slender, his face thin; but God made his word so effective that many of the nobility who, violent and cruel, had shed a great deal of blood, were reconciled on the spot. The affection and veneration for the saint were so universal and so strong that men and women ran to him en masse and the one who managed to touch the hem of his garment considered himself fortunate. Docile and confused, they all left, including Leo, the little lamb of God, who, gravely ill, had to be carried out in arms. The whole city of Bologna, and with it Ugolino, pleaded with Francis to permit the friars to dwell in the house built by devotion of which they were not considered owners, but rather it had been given to them as an alms. With reluctance Francis at last yielded, but in protest he did not want to be housed in the monastery, and all its occupants were ordered to do reparatory penance. Later, in Ugolino’s company, Francis retired to the monastery of the Calmaldoli, raised on the majestic peaks of the Apennines that, according to the description of Ariosto,18 look out over and dominate the Adriatic and the Mediterranean coasts, the sea of Tuscany and that of Slavonia, girded by ancient firs and leafy chestnut trees. The time he spent there in solitude and recollection was one of the periods of calm Francis needed so badly to revive his spirit and valiantly continue his work. After spending long hours in prayer and contemplation in Camaldoli, the two friends separated. Ugolino returned to Bologna and Francis to Mount Alverna. 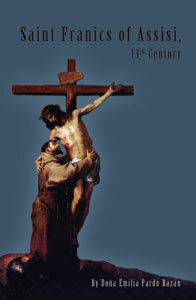 The young brother, burning with shame, flung himself at the feet of the saint and bathed them in tears of repentance. When Francis arrived at the valley of Spoleto, he found himself surrounded by his friars who came from the many monasteries in the vicinity to see him, to assure themselves with the testimony of their own eyes that he had not perished on the dangerous mission to Palestine. The partisans of extreme poverty, the future zealots, especially, abounded in joy for the return of the saint. This biblical and magnificent vision of Francis’ was nothing more than a representation of a truth the historian sees clearly at each step: that is, that divine ideas cannot descend to earth without exposing themselves to tarnishing their luster and beauty due to human imperfection. Just as every piece of soot is noticeable on white linen and the slightest breath sullies diaphanous crystal, so Francis considered the slightest stain on the purity of his order the gravest defect. 4 According to Mateo Paris, the number of captive Christians to whom Malek gave their liberty on one occasion was estimated at thirty-thousand; and, at his death, he left a great sum destined for Christian hospitals and for the redemption of slaves. 6 With regard to the ancient legend preserved in the archives of Santa Cruz of Coimbra, the historian Marcos of Lisbon relates this incident in a different way. According to the old manuscript, what the queen asked of the missionaries was if she would die before or after her spouse. And the friars gave as their reply that the one who was first to go out to receive their relics would die first. With that, the queen, on receiving notice that the remains of the martyrs were approaching Coimbra, begged the king to go ahead and she would join him promptly. The relics were one league from Coimbra and the king and his retinue were going to meet them when a shaggy boar crossing over a wall incited Alphonse II, a great lover of the hunt, to enter the woods. And the queen, who was coming behind him by the well-worn path, was the first to come upon the holy bodies. She understood that, in spite of her ruse, the weight of the sentence would overtake her. 7 Princess Sancha died in the odor of sanctity and was greatly venerated by the Portuguese people. 9 Based on the date the execution of the Franciscan protomartyrs was verified, the miramamolin who was their executioner must have been El-Mustansir, son of the Green King defeated at Las Navas. The emperors of Morocco took the title of Amir-el-Mumenin, that is, the Prince of the Believers, ever since one of them, Jusef, conquered the country ruled by the Moslems in the Peninsula. All the Mohammedan princes recognized him as chief and lord. And the Spanish, by corruption, made of Amir-el-Mumerin, the word, Miramamolin. El-Mustansir, in a certain way the inheritor of the warlike gifts of his father, the Green King, died in the year 1224, at the age of twenty-one, having been gored by a ferocious cow who, with a great number of bulls, he brought from Spain for bullfights, of which he was extremely fond. The protomartyrs having won their crown in 1220, it seems that El-Mustansir was sixteen years old when he split open their skulls with his scimitar. 10 The Bishop of Lisbon, the provincial of the Friars Minor in Portugal, and Dr. Juan Tisserando wrote the acts of the martyrs as well, arranging the data provided under oath by the Infante’s men of arms. 11 Although many of St. Francis’ historians, and among them the most recent, Fr. Palomes, set the date of the martyrdom of the seven friars in Ceuta one year after that of those of Morocco, Friar Magliano, who so painstakingly and diligently rectifies the chronology of the Franciscan legend, shows how this event could not have happened until 1227, as is clear from the chronicles of the twenty-four generals, and thus the corrected breviaries record it. says Leopardi, describing the attitude of the soldiers of Leonidas in the defense of the memorable pass. And the ancient Franciscan chronicler had already written, in almost the same words: Ibant illi gaudentes Dominum laudantes, perinde ac si ad opiparum essent invitati convivium. 14 In 1227, Friar Agnello, St. Francis’ companion, took the title of Bishop of Fez and Morocco, by the apostolic letter of Gregory IX. Since then, not without great vicissitudes and at one time persecutions and martyrdoms, Franciscans have not ceased to reside in Maghreb. It is quite curious to note how the Moroccans, resistant and obstinate in receiving the gospel, nevertheless venerated the friars more and more to the point that they were apt to attribute public calamities to whatever trouble they may have caused them. Concerning this matter and others no less interesting with regard to our neighbors of Africa, see the recent work by Fr. Manuel Castellanos, Descripción histórica de Marruecos. 15 The Franciscans, who in Africa wore their traditional tunics and cowls, have found it necessary in Spain to hide them under a type of ecclesiastical cloak and to cover their heads with a sombrero in order not to attract attention and, perhaps, provoke the aggression of the people. 16 The garden of the Hesperides is believed to be located in the territory of Maghreb (Mauritania Tingitana in ancient geographies) and toward the last spurs of the Atlas mountains on the ocean. 17 It was called that of the Desert of Contrada. 18 . . .Appenin scopre il mar Sclavo e il Tosco. . . .
19 Bonœ gentes: Dominus det vobis pacem. 20 Sic incident bastardi Ordinis.